The past month or so was busy for Clogs -- in addition to releasing their fifth full-length album, The Creatures in the Garden of Lady Walton, the band played high-profile shows in Minneapolis, New York, and Knoxville. We thought we'd recap the month's doings in further detail. Like their new approach to cover art - once muted and minimal; here a spectrum of vivid color - The National's Bryce Dessner and Co. have crafted a new version of Clogs that revels in pushing boundaries and redefining their sound... Lady Walton contains the most accomplished and varied music Clogs have recorded to date. 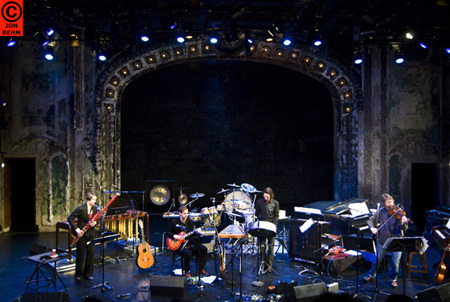 Fusion experimenters Clogs take a modern approach to folk-flavored chamber music. Led by composer Padma Newsome (the National), they build their courtly Renaissance sound on intricately woven strands of ukulele, violin, bassoon, and percussion... On Creatures, Clogs imagine a graceful space that's always worth revisiting. For more reviews of The Creatures and the band's EP-length prologue Veil Waltz, check out The Faster Times, All About Jazz and, well, Google away if you want more. 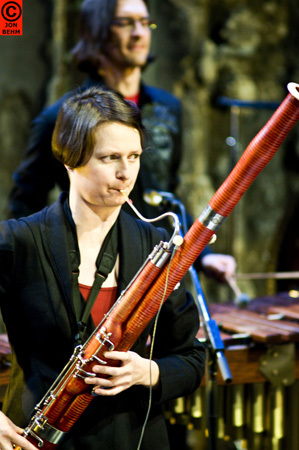 Rachael blows her bassoon while Thomas marimbas. Shara Worden (of My Brightest Diamond) embraces the audience as Clogs stands behind her. 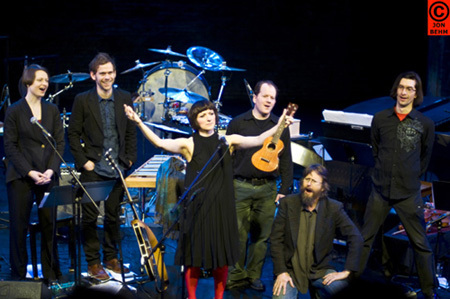 Next Clogs appeared twice in New York -- first on WNYC's Soundcheck with John Schaefer featuring an interview and live performances. (Listen yourself here.) Next came their official release party at Brooklyn's Bell House. Naturally, BrooklynVegan was there to document it all. Don't forget the Brassland Store currently features specials on The Creatures, limited quantities of Clogs' Lantern, on vinyl, and free shipping on US orders. And, on that commercial note, good day to you.